The holiday season is the perfect time of the year to add some extra va-va voom to your wardrobe. From oversized rings to super chic statement necklaces, there's several ways to elevate your look for holiday bashes and celebrations. Take this Jane Stone vintage necklace for example, the bold rich emerald hue combined with chunky jewels instantly grabs attention and screams glam. My love for statement necklaces is not seasonal, as I tend to wear them year-round, but if you are not as daring with your accessories this is the perfect time to experiment with a new look to transform an otherwise minimal outfit. 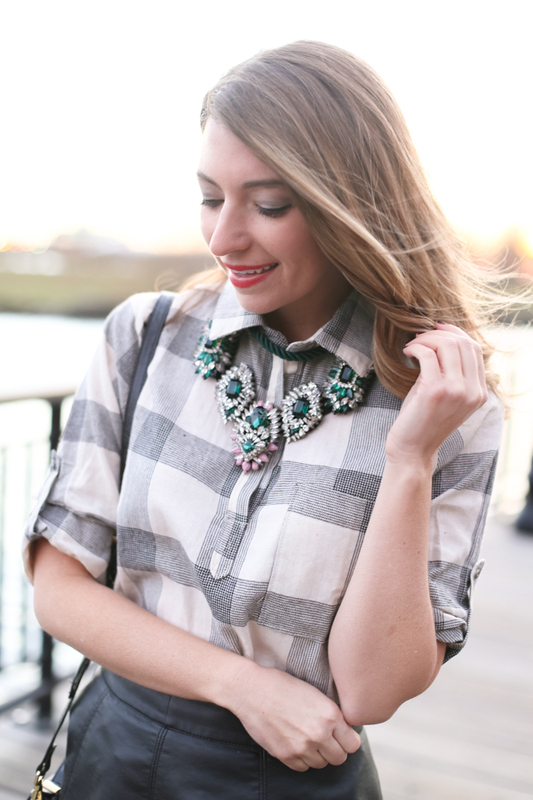 I'm a sucker for flannels and patterned shirts throughout the winter months and this Pink Slate plaid top certainly ranks high on my weekly wardrobe rotation. I love how versatile these tops can be- you can pair them along with a statement necklace (as pictured above), or throw a sweater on top for a more polished and preppy look. For this outfit I wanted to illustrate how easy it is to get more milage out of a standard ensemble by incorporating in statement accessories. Don't be afraid to play around with bold pieces! To shop more holiday statement pieces with Jane Stone simply click here. Don't forget to give them a follow on instagram to learn about special discounts and holiday promotions.